A friend of mine asked if it were possible to define an upright pi to use to represent the constant number pi. ISO standards recommend this as well as upright i and e for their respective mathematical constants, but it’s not common to see the upright pi due to the constraints of most maths fonts. I’m not aware of a general solution to accessing an upright pi (until unicode-math becomes more widespread), but luckily in this case we were working with the Palatino-based mathpazo fonts. Palatino was designed by Hermann Zapf, who also designed the upright maths font Euler; like most of HZ’s fonts, these two harmonise very well together. So we can take Euler’s upright pi to use in our otherwise Palatino-based Greek alphabet. and all pi symbols in the document will be typeset with the upright glyph. 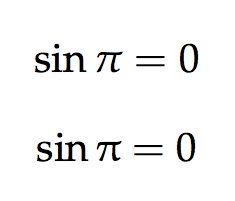 I wouldn’t anticipate most readers being able to distinguish the difference between these pi glyphs, so I suggest using discretion in mixing the two. Disregarding the nonsense maths, I like it.